Teams representing four Arkansas universities won first place awards and a share of $154,000 in cash prices Thursday at the 2019 Arkansas Governor’s Cup Collegiate Business Plan Competition luncheon. 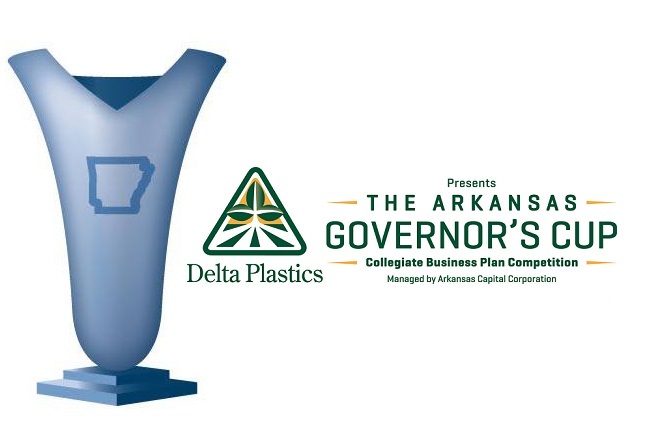 The competition was sponsored by Delta Plastics of Little Rock and managed by Arkansas Capital Corp.
Fintruth, University of Arkansas (first place, $25,000). Its software-as-a-service for businesses works with existing online accounting software to identify potentially fraudulent and wasteful spending. ScreenBux, UA (second place, $15,000). Its product allows parents to manage their children’s screen time while teaching them about budgeting. CorroSense, UA (third place, $10,000). Its Radio Frequency Identification Devices (RFID) technology monitors corrosion in new and aging civil structures. Vascugenix, University of Arkansas at Little Rock (first place, $25,000). Its device improves the safety and efficiency of cardiovascular procedures. XTendon, Harding University (second place, $15,000). Its products increase the functionality of limps and relieve pain associated with spasticity, a symptom commonly experienced by those with neuromuscular disorders. Bone Dri, Ouachita Baptist University (third place, $10,000). Its product uses silica gel to dry out waders. Lucky Cricket Snack Factory, Arkansas State University (first place, $5,000). It uses flour made from crickets to manufacture protein shakes, granola bars, brownies, chips and more. Locally-sourced pet treat provider Tank’s Treats, A-State (second place, $3,000). CorroSense, UA (graduate winner, $5,000). In addition, faculty advisers for the six teams that placed in the Walton Family Foundation Graduate Division and Winrock Automotive Undergraduate Division were awarded $2,000 each. Another highlight of the Governor’s Cup was the live elevator pitches given by finalists. The winner for each division was chosen by the audience via text. Cole Jester of Bone Dri and Sandra Bagley of CorroSense earned another $2,000 in cash for their winning pitches. Fintruth, Screenbux, CorroSense, Vascugenix, XTendon, Bone Dri, Lucky Cricket Snack Factory, Tank's Treats, Sandra Bagley, Cole Jester, Governor's Cup, Delta Plastics, Arkansas Capital Corp.